In installations like 'City Chase' the audience is invited to enter a custom-made space or another environment that challenges the 'hearing'-position, as it is often conditioned in a disciplinary setting. Usually a multiple channel sound-installation is used to extend directional qualities in the acoustics. In these works, previously made field recordings form the basis for the sound, which has been treated in a special way. In 'City Chase' sounds were recorded while biking through cities. As is clear from the takes in the city of Kortrijk and the outskirts: no focus appears in the recordings. The sounds’ origin always moves from one source to another. 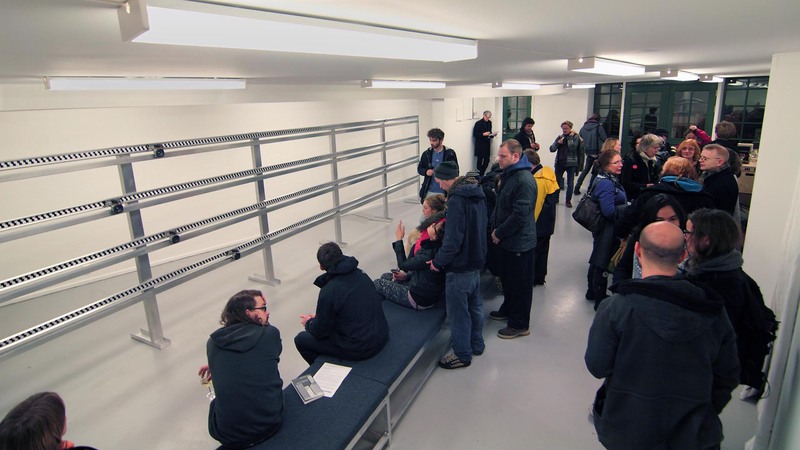 In the installation the audience hears these pre-recorded sounds only when the speakers move. There are four rails with one speaker on each of them. Computer-controlled motors move them according to a composed choreography. The rails and benches are almost 10 meters long; their length is flexible to adjust to other and future exhibition spaces. In short, City Chase tries to democratize the motion of public resonance to our hearing. 2011 - 2012 Resonance European Network for Sound Art. Festival of Flanders, Kortrijk (B), November Music, Den Bosch, Jan van Eyck Academy, Maastricht, Audio Art Festival, Krakow, Lydgalleriet, Bergen, DordtYard, Dordrecht. Aluminium construction, benches, motors, Arduino, Mac Pro (software: Reaper, Pure Data), 4-channel speaker system.